I feel very lucky that sometimes a work email can make me do an actual little jump for joy! That’s exactly what happened when I was asked to be part of this Wes Anderson inspired wedding shoot. I’m a massive Wes fan and there are just so many awesome buildings and objects in his films that are crying out to be transformed into gingerbread versions. At the very top of that list surely has to be The Grand Budapest Hotel; ever since I saw that film I’ve wanted to make a gingerbread hotel worthy of Mendl’s bakery! 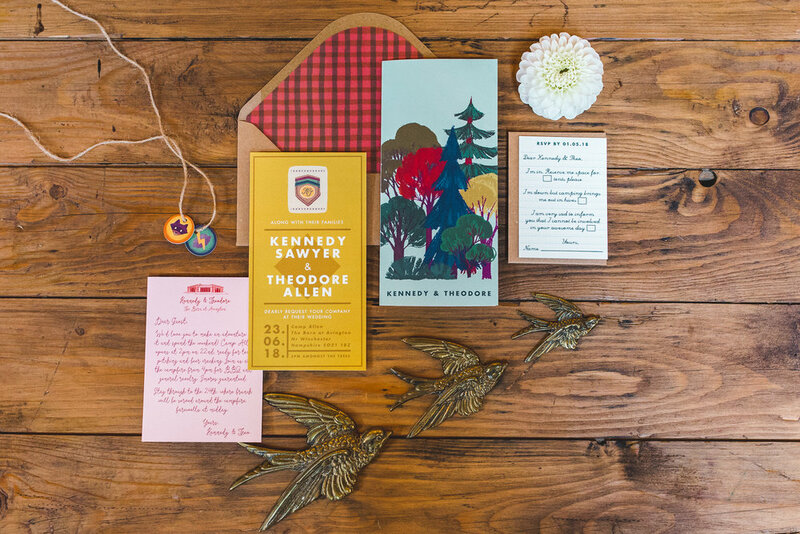 Wes Anderson inspired wedding stationery by White Cottage Weddings. Photo by Kirsty Mackenzie. 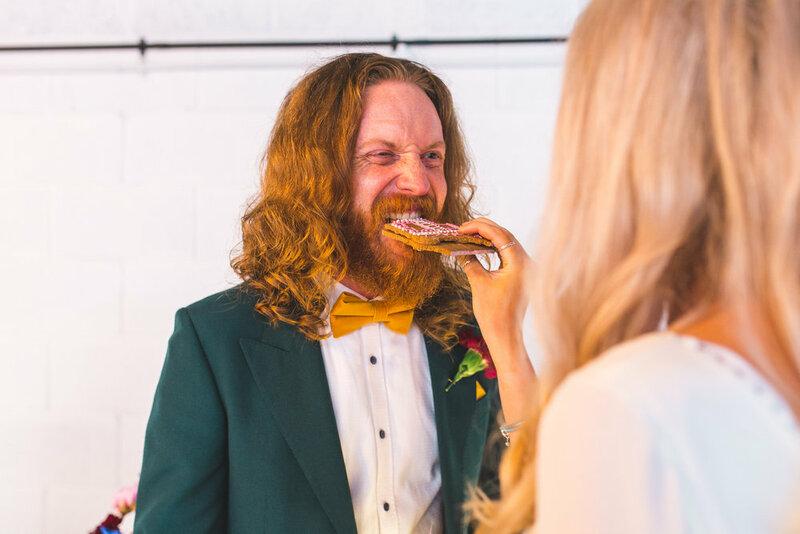 Wes Anderson inspired wedding at The Barn at Avington. Photo by Kirsty Mackenzie. As with most big 3D builds I started by studying lots of images of the hotel, including screenshots from the original film along with some illustrators’ interpretations and other drawings. Then I made a scale cardboard model of the building to work out which aspects I wanted to include, how to put it all together, and how many biscuits to use in the final design. Once I was happy with my version of the hotel (I wanted to make it recognisable, but retaining my signature style with lots of natural gingerbread and piped icing details) I created templates from the cardboard building and used them to bake all the biscuit components. Then came the fun bit - hand piping over 100 windows in different shades of pink! Once these were set I carefully assembled all the main hotel components, adding icing turrets to the two wings and then added the roof pieces. 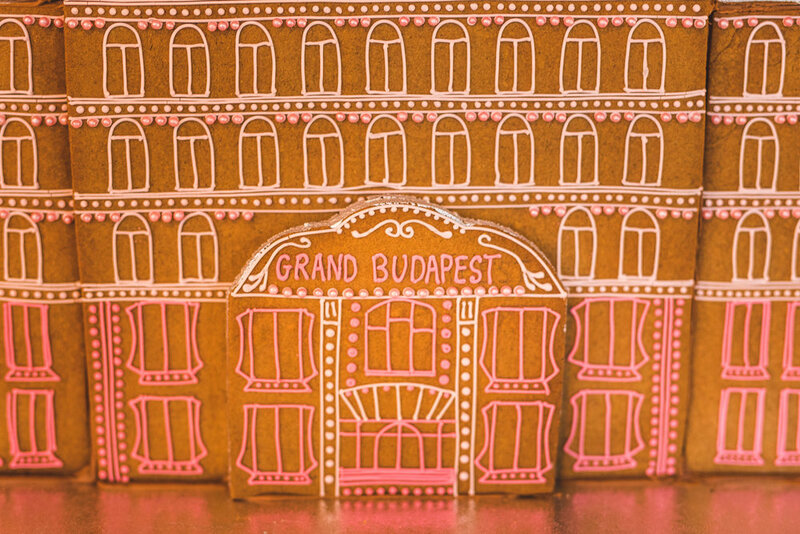 Hand-piped icing windows on The Gingerbread Grand Budapest Hotel. Photo by Kirsty Mackenzie. Finally, I painted the roof and turret domes with edible metallic silver paint (my favourite! ), added lots of tiny edible pink pearls to accentuate the details around the windows, and some edible diamonds along the rooftop to give it a beautiful sparkly luxurious finish. The Gingerbread Grand Budapest Hotel. Photo by Kirsty Mackenzie. Just checking it tastes as good as it looks! (Always.) Photo by Kirsty Mackenzie. 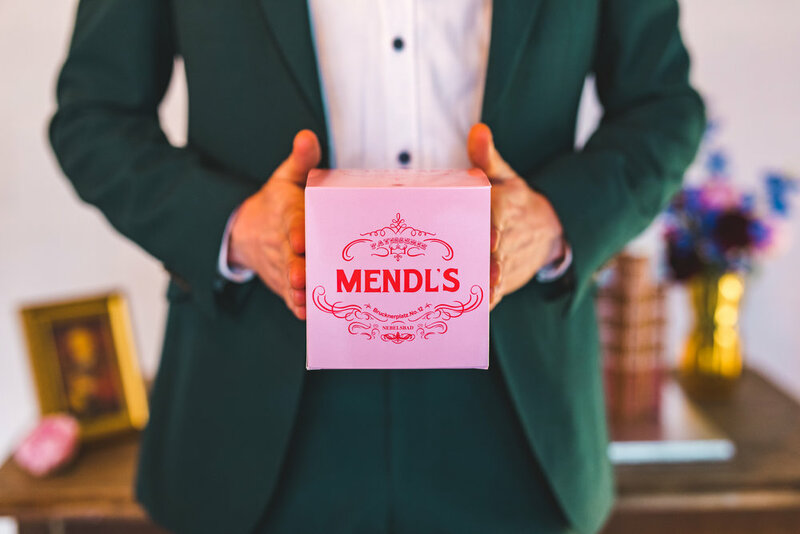 Mendl's cake boxes inspired by Wes Anderson's Grand Budapest Hotel. Photo by Kirsty Mackenzie. 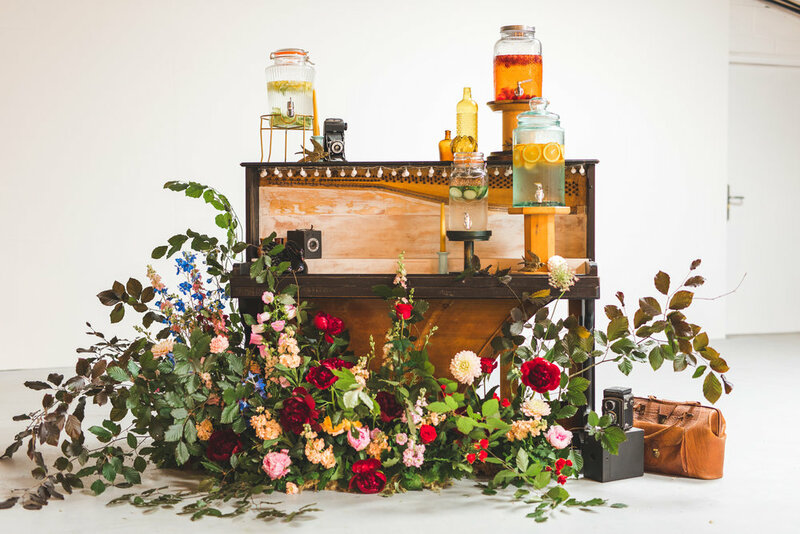 A colourful piano-based cocktail bar with stunning floral display would make an amazing focal point in almost any style of venue and can be totally personalised to fit with your colour scheme (and favourite drinks!). Piano bar by With These Hands, flowers by The Wild Fox. Photo by Kirsty Mackenzie. Or why not commission a bespoke flag, either as a stunning personalised backdrop or as an alternative table plan? Flag by White Cottage Weddings. Photo by Kirsty Mackenzie. It was SO much fun to be part of this amazing shoot with an absolute dream team of wedding suppliers. I absolutely loved creating such an iconic building in edible form. Please do get in touch if your favourite film features a building you’d love to see made out of gingerbread.